Medical staff at a hospital in Peshawar treat a victim of the bomb atttack at a madrasa. 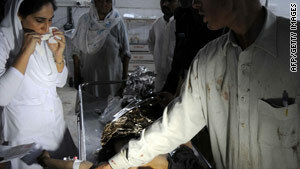 Islamabad, Pakistan (CNN) -- Bomb attacks in Pakistan killed four young people Wednesday, police told CNN. Three were killed and two were injured in a bombing in the northwestern region, said Muhammad Karim Khan, a senior Peshawar police official. A roadside bomb was planted near a madrasa, or a religious school, said Khan. He said initial information indicated that the victims were madrasa students and between the ages of 15 and 20-years old. In the southwestern province of Balochistan, a bomb destroyed an oil tanker carrying fuel for NATO operations in Afghanistan, said Abdullah Khan, a police official in the province's Chaman district. He said one boy was killed and another was injured in the detonation of an improvised explosive device that had been planted on the oil tanker. He said the tanker was traveling from Quetta, Pakistan, to Afghanistan.